Specialists from BMW, HOERBIGER, the Graz University of Technology, and HyCentA develop a hydrogen combustion process which achieves remarkable efficiency for internal combustion engines for passenger cars. Munich March 12, 2009; The BMW Group Forschung und Technik, in cooperation with researchers in Graz and Vienna, Austria, has succeeded in developing a dedicated hydrogen combustion engine with diesel-like geometry and progressive H2 high-pressure direct injection technology. The result is an efficiency level of up to 42 percent, on par with that of the best turbodiesel engines. Partners in the “H2BVplus” project, which is sponsored by Austria’s Federal Ministry for Transportation, Innovation and Technology (BMVIT), are the Institute for Internal Combustion Engines and Thermodynamics at Graz University of Technology, HyCentA Research GmbH in Graz, as well as HOERBIGER ValveTec GmbH in Vienna. “In light of the limited availability of fossil fuels and the rising environmental impact from harmful emissions, we are convinced that the H2 combustion engine will assume an important position in the product portfolio of future alternative drive concepts. It will crucially contribute to safeguarding our individual mobility at the high level the customer expects,” said Professor Dr. Raymond Freymann, Managing Director of BMW Forschung und Technik GmbH. The newly developed combustion system combines the strengths of spark-ignition and diesel concepts, while utilizing the favorable combustion properties of hydrogen, and thereby achieves efficiency values that easily bear comparison with even those of state-of-the-art turbodiesel engines. In the process, the engineers based their work on the joint EU “HylCE” project, during which maximum specific powers of up to 100 kilowatt per liter of displacement were demonstrated for a spark-ignition hydrogen combustion process. Engineers from the BMW Group Forschung und Technik developed a new cylinder head for hydrogen operation based on a production diesel engine. The combustion chamber of the engine was configured jointly by BMW and the Graz University of Technology using numerical flow simulation. HOERBIGER ValveTec GmbH designed high-pressure injectors for direct injection of hydrogen into the combustion chamber with pressures of up to 300 bar, nearly 4500 psi. These injectors were tested and calibrated at the Hydrogen Center Austria, which also provided the hydrogen infrastructure. 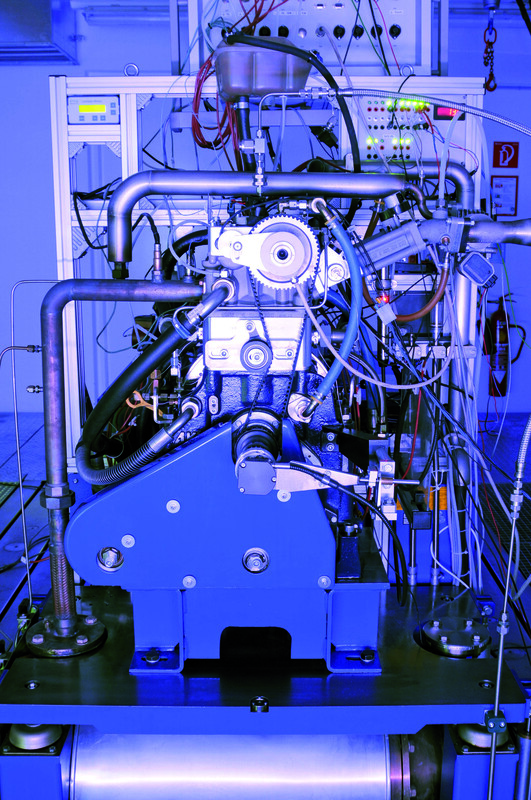 Extensive test runs on the test benches of the Institute for Internal Combustion Engines and Thermodynamics of the Graz University of Technology have shown that a combination of spark-ignition and diesel combustion systems using surface ignition subsequently followed by a diffusion type of combustion is the ideal solution with respect to engine efficiency. As a result, the entire characteristic engine map range of a typical passenger car engine can be covered and top level efficiency values are achieved. Attendant benefits are the increase in specific power and reduction of fuel consumption. Thus, even in an early concept phase this combustion system matches the efficiency values of the currently best turbodiesel engines at a maximum of 42 percent. As the exhaust gas heat of internal combustion engines can be used well due to the high temperature levels, further increases in overall efficiency will be possible in the future as a result of waste heat utilization. BMW Forschung und Technik GmbH is a 100% subsidiary of BMW AG and has been responsible for research within the BMW Group since 2003. Its subject areas cover Vehicle Technology, CleanEnergy (hydrogen technology), EfficientDynamics (intelligent energy management/alternative drive systems), ConnectedDrive (driver assistance/active safety) and ITDrive (IT and communications technology). Its legal independence as a limited company guarantees creative freedom and maximum flexibility. Global access to new trends and technologies is ensured by an internationally established network with branches in the USA (Palo Alto, CA and Clemson, SC), Japan (Tokyo) as well as liaison offices in France with Eurécom (Sophia Antipolis) and in Germany (Saarbrücken) with the German Research Centre for Artificial Intelligence (DFKI GmbH). HOERBIGER ValveTec GmbH is a company of the HOERBIGER Group. HOERBIGER is active throughout the world as a leading player in the fields of compression technology, automation technology and drive technology. The focal points of its business activities include key components and services for compressors, gas-powered engines, and turbomachinery, hydraulic systems and piezo technology for vehicles and machine tools, as well as components and systems for shift and clutch operations in vehicle drive trains of all kinds. 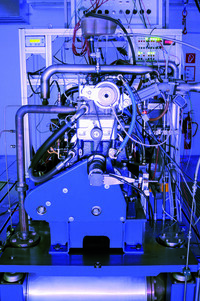 The core objective of the Institute for Internal Combustion Engines and Thermodynamics at the Graz University of Technology is to carry out innovative and internationally recognized teaching and research within the interrelated fields of energy, engine, transport and environment, and in particular to contribute to solving environmental problems. Within the section "Innovative Combustion Systems" new combustion processes are developed not only for conventional fuels, but also for alternative fuels (e.g. natural gas) and energy carriers (e.g. hydrogen), which are becoming more and more important. In general, these research activities focus on all relevant targets such as maximum efficiency and power density as well as minimum emissions. The HyCentA (Hydrogen Center Austria) promotes the use of hydrogen as a regenerative energy carrier. With its hydrogen test center and the first hydrogen delivery station in Austria, the HyCentA acts as a focal point and information platform for hydrogen-oriented research and development activities.